GREAT HOTEL DEAL GOES NUTS! The LeapFrog Group is a Sydney based travel company, specialising in providing travel packages to the Travel Agency Industry. 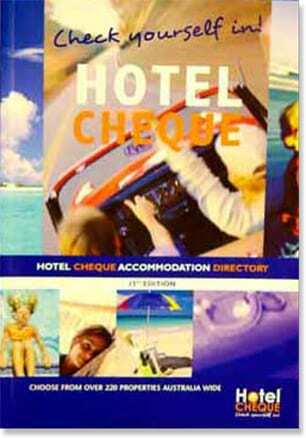 The company has a number of divisions, one of which is Hotel Cheque Pty. Ltd., which specialises in offering heavily discounted hotel accommodation to consumers. John was invited to be involved with the company – with his brief being to popularise the hotel accommodation discount offer. Hotel Cheque’s business model was very simple. 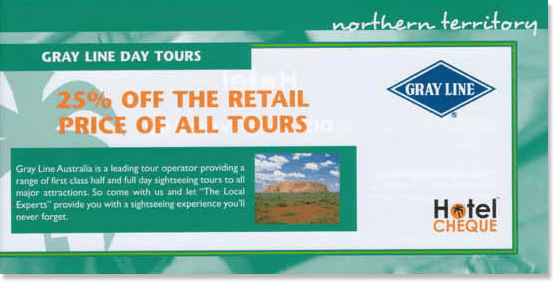 The company negotiated extraordinary accommodation discounts from hundreds of hotels around Australia, on the basis that guests enjoyed breakfast and dinner at the premises. With accommodation averaging around 65% occupancy at most hotels and resorts, the hotels were happy to provide such extraordinary discounts in order to fill rooms and therefore benefit from Food and Beverage expenditure. (Breakfast and dinner). However, until John’s arrival, Hotel Cheque’s accommodation packages were predominantly used by the company as “promotional incentives” for various retailers and service providers. For example, the likes of Harvey Norman would promote “Get 2 free nights accommodation and any of 100 hotels, absolutely free when you buy a plasma TV”. John’s role was to consider “retail options” for the hotel offer. this extraordinary hotel accommodation deal. 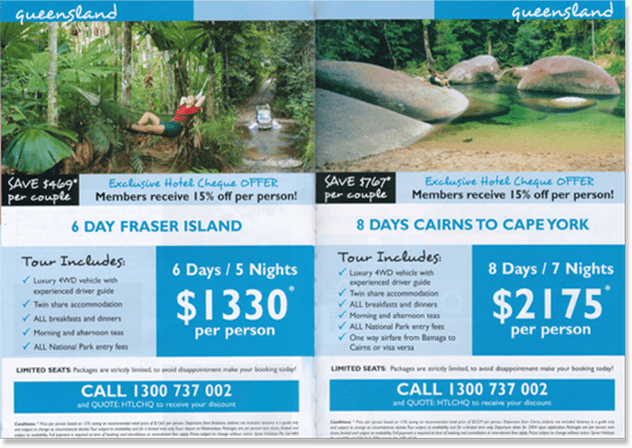 This was an extraordinary travel/holiday offer, with over 200 hotels around Australia to choose from, each of them costing less than $10 per night for twin-share accommodation! That’s less than $5 per person per night! After he produced the television commercials, John negotiated excellent daytime rates with Capital City and Regional Networks, and then engaged the services of a Call Centre that had handled response from such marketing previously. John also negotiated with Radio Stations, newspapers and magazines, where the media shared revenue with Hotel Cheque, in return for providing advertising space. In all instances, the offer of 10 nights twin-share accommodation for just $99 obviously had a powerful and magnetic appeal to the general public, with the meal condition of course, always being appropriately featured. The vast majority of consumers who were attracted to this offer, completely understood the meal condition as being more than fair. 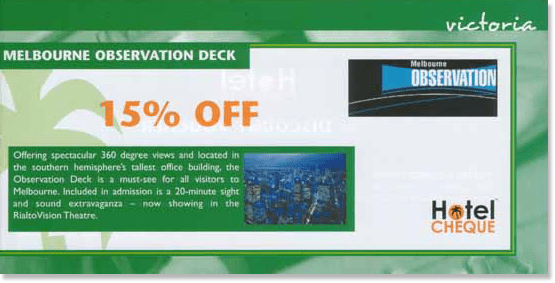 Aside from hotel cheques, respondents received various discount vouchers to attractions. Purchasers were given a booklet of cheques which they could use at any time during the 12 month period. The result of the Television Infomercial Campaign was overwhelming to say the least! Some of the TV Infomercials had a response of between 500 and 1000 phone calls within the first half-hour, which prompted the supervisor of the Call Centre to comment “this was the largest response ever recorded for a product or service by the Call Centre”! And this was certainly saying something, given that this particular Call Centre had handled consumer response to TV Infomercials featuring exercise equipment, weight reduction pills, kitchen appliances and various other highly popular gadgets.